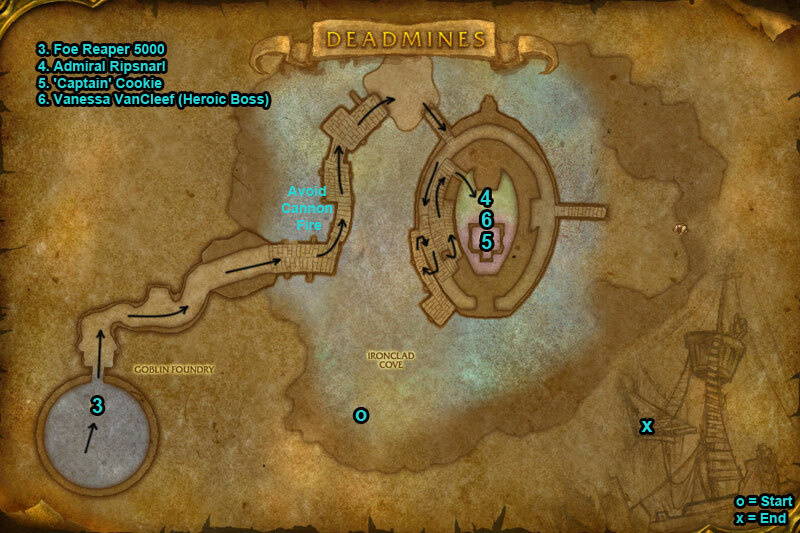 You can find the Deadmines dungeon within Westfall, Eastern Kingdoms. Go inside the building with a side door. 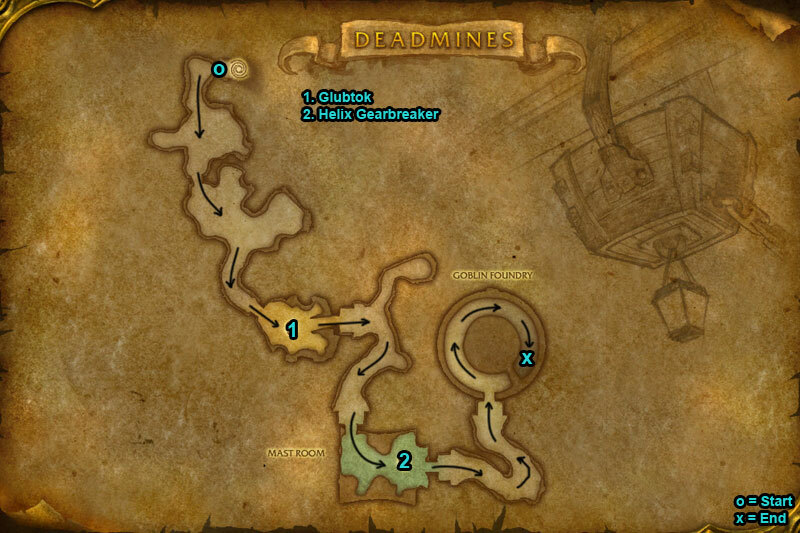 Run through the Defias Hideout, head up the stairs and follow round into a cave. Follow path round and take the right hand side turnings, this should lead you to the portal entrance. /i Boss will Blink teleporting to a new location. Avoid blossoms launched around room. 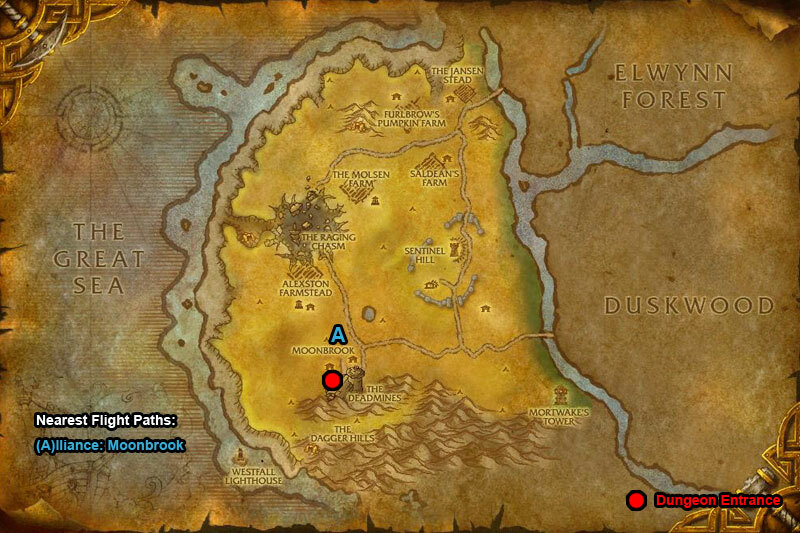 Heroic Differences: Fire & Frost Blossoms summon mobs when land. Avoid rotating Fire Wall. /i Kill Oath he’s riding then Goblin. Watch out for Sticky Bomb, avoid these on ground. Heroic Differences: Stay apart from each other in case get a Chest Bomb on you. Helix Crew appear above throwing Sticky Bombs at random players. /i To activate boss kill all the other foe reapers. Boss deals physical damage, try to avoid attacks. Heroic Differences: Activation of Foe Reaper causes overload in pit spawning Molten Slags to fight, jump into a Prototype Reaper to attack. /i Avoid melee attacks. During Fog kill the Vapors. Be ready to target boss when he reappears. Heroic Differences: When boss below 10% health 3 more Vapors appear. /i Attack when boss is inside the cauldron, nuke him. Can pick up gold foods, avoid green foods. /i You will be transported into waves of nightmares to fight your way through. When she casts Fiery Blaze to detonate explosives around ship run to a rope & swing to safety (ropes by edge of ship on floor). Calls Defias mobs to aid her.